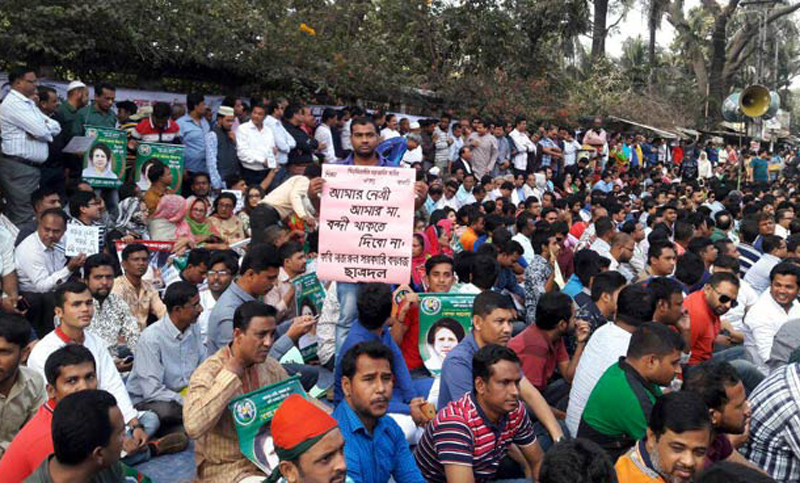 As part of its countrywide programme, BNP leaders and activists started observing a 6-hour hunger strike in the city on Wednesday morning demanding the release of its chairperson Khaleda Zia from jail. The programme began around 10am in front of the Jatiya Press Club. It will continue until 4pm. Several Hundred leaders and activists, including party standing committee members Khandaker Mosharraf Hossain, Moudud Ahmed, Nazrul Islam Khan, Amir Khasru Mahmud Chowdhury, joined the programme amid tight security by police. BNP's different district and city units are also scheduled to observe similar programmes at their convenient time and places. Earlier, BNP leaders and followers formed a human chain in front of the Jatiya Press Club on Monday and staged a sit-in programme in front of party's Nayapaltan central office on Tuesday protesting the jailing of Khaleda Zia by a lower court in a graft case.